Today I am thirty one. Which...honestly is really strange. Because I would swear I was only 26, 27 tops. But if you do the math, I am indeed 31. I have work today and class tonight, so we celebrated my birthday with my family last night. It was awesome. My mom made a delicious dinner and we had a Heath bar cake. And I got some awesome gifts. So awesome in fact, I am going to share them with you now. Just to highlight that at 31, I am still a total and complete nerd. We will start with the little less nerdy and a little more awesome. Boo got me some gray chucks that I have been dying for. I wore converse all through high school, and I am so sad that my little maroon pair that I loved most of all have been lost in time. So I got my new gray pair, and I will wear them until the fall apart. Being that my sister is awesome, she also got Henry his own pair too. So we can be all matchy. And they are high tops. Awesome. 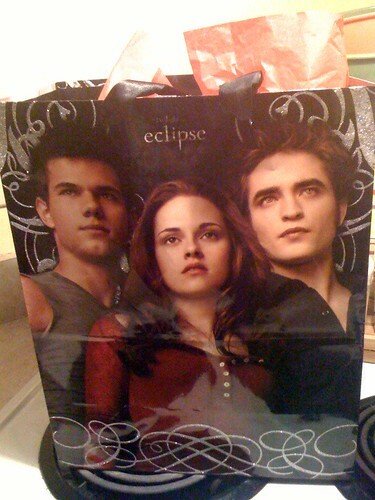 My next present...well...it came in this gift bag. Because...you know...it's funny. And a joke...and...Oh okay fine. Because Missy knew I would love it. Inside the bag was the audio book of The Hunger Games, which I am ridiculously excited about. Because if it is a young adult novel, I am going to become obsessed with it. Then my husband...oh he got me this. That's right. 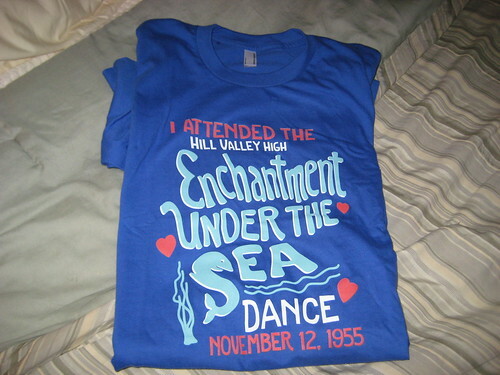 It's an Enchantment Under the Sea Dance t-shirt. You know...from Back to the Future. What? You didn't know? Because you aren't a total nerd like us? Well, that is so sad for you. And now I am sure you are like, well...that's fine, but it isn't like she will wear it out of the house...WRONG! It's my birthday and I will wear what I want to. But I have it on with my chucks...and my jean jacket. So I am going for...sort of a... Oh, never mind. I am a nerd. Henry is going to be so embarrassed by me when he gets older. Happy Birthday! Love the matching converse! 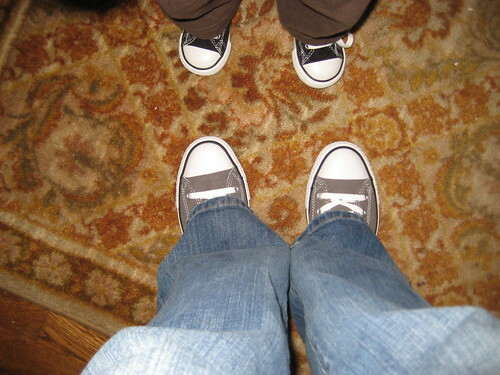 I love the converse...I, too, have a pair and my daughter has matching ones :o) LOVE the shirt! I so did not know they made those...I'm definately going to have to google that! Happy Birthday....the 30s are the BEST! Happy Birthday, sweetie! Can't believe you are 31 either. Seems like just yesterday you and Liz were playing dress-up at my house. Oh - and I gave Tom a "Smallville High" t-shirt for Christmas because we are geeks as well. Yay :) Happy Birthday to you!! Hope you have/had an absolutely wonderful day! Awesome! And NERDY is COOL! Happy birthday! Cute shoes ;) I have had many people tell me that the hunger games is a good book. I should check it out. Let us know what you think. Anyways, I totally knew what your t-shirt was from. We watched that movie over and over and over again while I was growing up. My dad and brother were obsessed with it. Little Converse = totally adorable!! I'm 31 this year too- and its SO surreal isn't it?? Happy, happy birthday! 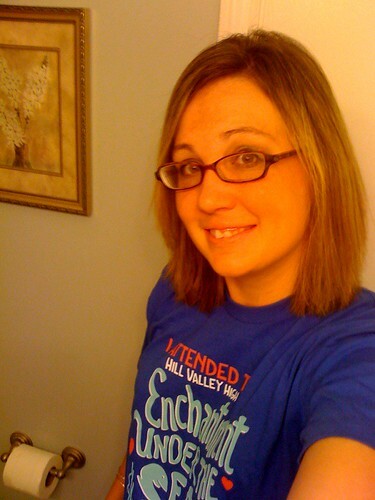 Love the Enchantment shirt! Hope it's a great day! LOOOOOOOOOVE the shirt, that is AWESOME! I'm a little late, but HAPPIEST of Happy Birthdays!! :) Love the shirt and the shoes!! Happy Birthday and Happy ICLW! Happy Birthday! I love those types of shirts that are super nerdy, but only to other nerds. Though you had me worried with the gift bag there for a moment.